posts have ratings to discourage one-liner “me toos” replies and also to make quality discussions more visible. not sure though which scheme is best, what do you think? would be nice to have a historical archive of the most interesting/popular/etc threads of all time. right now if it’s old enough it’s basically lost forever, because it’s too much effort to dig through the archives. there’s a lot of interesting data/stas about mailing lists we don’t make use of… how many people are listening when i write a post to say Fedora’s devel list? 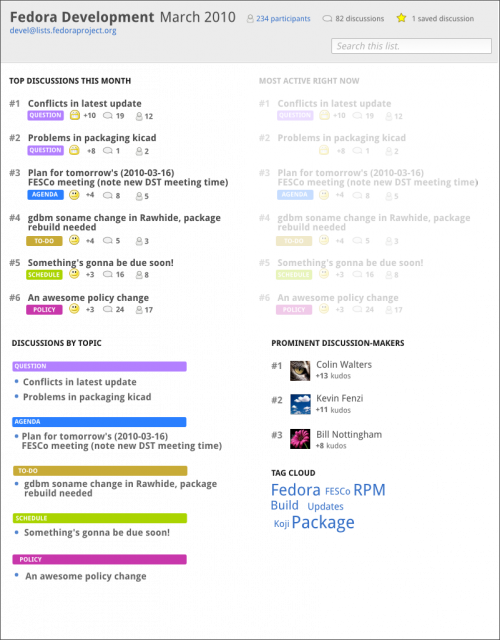 « Fedora 13’s Artwork – Need Your Help for F13 Beta! This idea has also been in my head for a very long time, but never got round to do it. Mailinglists aren’t very accessible and the web interface most lists use isn’t helpful at all. A forum like view makes things much more friendly and gives a better overview of the discussion. The only way to have an overview right now is to have the whole thread in a mail client, but a lot of the time i get pointed at discussions on lists i’m not subscribed to and you are stuck with that mailman thing that stacks everything into a tree in levels that i still haven’t figured out how they are sorted. Then you need to go back and forth the read the whole discussion. I always get lost in mailinglists. And then there’s all the whining about “you didn’t top/bottom post”, “you didn’t reply all”, “the header info got lost”, “your attachtment is too big, waiting for moderation” etc. which makes using mailing lists not fun. Tip: If you add a small form at the bottom you can let that send n e-mail to the list for that user. It will basically be a forum that people can e-mail to if they want. So you don’t have to use your e-mail client at all. When this is implemented I’m sure I’ll spend more time on mailing lists. Well, if having a web interface like this will encourage people to break threading, top post, send huge attachments and so on, making the life harder for those of us using a proper mail client, then I think is not a good idea. Hi Nicu, it absolutely needs to interface with existing list interfaces too. It’s not meant to replace, but augment. I understand this, but when I see things like “top post”, “flat view”, “attachments” I remember why I don’t waste time on forums. And an invasion of “me too”, AOL-style. Wait wait wait a minute! Where did I say top post? I don’t think any of this should be creating top-posts.. This shouldn’t effect or degrade the current mailing list experience at all. It’s just a different view onto the same data. So if you prefer the email-centric way you wouldn’t be affected by the tool. I was replying to Hylke, who seems to want a forum-like experience. I saw a lot of time the debate inside various projects if to use forums *or* mailing lists, that I made my mind. The only forum I moderate these days is a local (Romanian language) Fedora forum and I find this so time-consuming that in the last couple of weeks, being busy, I think I accessed it once, leaving the work to the other guys in the team. I put on tighter filters somewhat recently because I couldn’t deal with all the moderation email. Feel free to tune them down if you want though. Awesome. More feedback coming via email. This is cool, but it seems to be duplicating the functionality of sites like stackoverflow.com. Why not mimic them instead? Oops, looks like Gökhan beat me to the punch. stackoverflow doesn’t let you interact with existing mailing lists. Awesome! This is much needed. Anything that lowers the barrier of entry for both navigating and contributing to mailing lists is a huge plus! With an interface like this I think it will promote more people to contribute to lists rather than post on sites like fedoraforum.org where issues might go unnoticed by devs. 1. Make the first sentence of the newest post to a thread visible in the summary. 2. Many other gmail users will likely recommend taking ideas from the way http://mail.google.com and http://groups.google.com groups discussions. > 2. Many other gmail users will likely recommend taking ideas from the way http://mail.google.com and http://groups.google.com groups discussions. I’m a GMail user, and I hope Mairin will not take ideas from them. GMail’s ergonomy is just awful (especially in the way it handles mailing lists and threads in genera), and I’m convinced Mo can come up with much better (and these mockups are gorgeous by the way). Except this will never, ever, ever, ever have those horrifying Google Wave scrollbars! I understand I may sound completely different that all the other people who commented so far, but I am not sure I understand who is the target for such an interface. Someone like me using a proper mail client won’t see and use any of those features. I use web interfaces only when having to search something in an archive and I like the full threaded view for that. The fear is a forum like interface will bring a lot of the bad things and noise associated with the forums, I can deal with >500 new messages a day in my mail client, but won’t be able to keep up with so many forum posts. I suspect the target audience is a user (like me) who doesn’t want to subscribe to YAML (yet another mailing list?) just to post a question, request, possible bug, etc. I can sympathize with worring about signal to noise. But there’s got to be a better way than putting a barrier between you and your users. The target is someone who doesn’t want to deal with mailman. I definitely am in that camp. I cannot manage mailing lists for the life of me. You may have noticed as co-maintainer of the Fedora design team list – I have 10 different email addresses and when I pick the wrong one my posts get held in moderation. Frustrating. I just want to send a quick reply and maybe I don’t have access to a subscribed account. And we have a lot of signal-to-noise ratio on a lot of our mailing lists in the FLOSS community in general. The mailman archive interface is really painful for me to work with. It doesn’t even have search. Finding a message I know has a valuable nugget of information has taken me hours before. I work with the mailman archive more often, every week have to extract data from it for Fedora Weekly News and I am OK with that. Sure, I have my problems with it, one is search and you address it in this mockup, but I am sure search can be solved in an easier way (like a custom google query). Also, the security model is not great, with having a per-list shared password for all the admins: I moderate design-team and ro-community, have a shared password for each of them and being site-based, only one can be saved in Firefox password manager. Those are problems I would want to see solved… I don’t care much about sending mails with the wrong address, I also have over 10 addresses and aliases and at times forget to pick the right identity (own SMTP, a drop-down in Thunderbird, is easy), but mailman gives a warning and I can resend. Is something I can deal with knowing it keeps many abuses away. That looks like a brilliant idea for a Thunderbird (or any other mail/news client) extension. I hate mailing lists, so I make heavy use of gmane, which is a mail to news gateway. If this was implemented as an extension you would have the same functionality for any list or group you read. *Except* you wouldn’t have the value-add metadata like the ratings, which are especially important I think for figuring out which posters have the most clout / are worth following. That has to be stored somewhere communal I think. I think the mock ups are great. It could make the barrier to entry to get in on certain topics a lot lower. I think it’s a win-win for everyone. So I like the topic category idea. But I’m not sure how that would work. Don’t we need a layer of human beings plugging away at categorizing threads? And what happens when a to-do or agenda item thread jumps the tracks…and it is recategorizeable as long winded and boring. Does that fall off the agenda/to-do list? How do you prevent the digg style tagging from becoming exactly the sort of +1 ‘me too’ that you want to see less of? Since digg itself is about ranking articles… where the information of merit is typically in the article itself and not in the discussion threads associated with the article. I would be concerned that is the wrong model for ranking discussion threads where the most salient information could be buried in the discussion…especially for something controversial. Luke has been reading this natural language processing book… he thinks we can do some awesome things like that. But you do likely need some human beings plugging away – maybe the computer makes a guess and readers confirm or correct it. I think threads should be able to have multiple tags…. but maybe one defines them the most. Not sure. I actually totally ripped it off from fark.com.. I want to see less one-liner ‘me too’ posts. If people submit a +1 instead, that’s one less mail going out to the mailing list. Individual comments I think under the initial thread post could have rankings too. What do you think? So people will submit a “+1” instead of a “me too”, the “+1” will be visible only to those using the web interface and me, with a mail client, will be spared by this useless noise? Knowing only part of the users (those following the web interface) will see those “+1” means we cannot reliably use the system even if we want to, like for a quick vote on something trivial? So my idea for that is maybe we could add additional headers for the metadata. E.g, a new message comes in on a thread and it provides an updated X-Mailman-Thread-Rating header with the latest rating. If you’re using mutt in gnome-terminal, you don’t even have to copy-paste the url — just right-click and open in browser. There’d need to be some sort of short-link mechanism, though. It also looks like you might be able to take advantage of several of Mailman’s lesser known features, for example topics could map to Mailman’s keywords. I didn’t even know Mailman had keywords!!! Sounds worth exploring! brilliant… i always dread the times where the answer i need is on a mailing list web archive. It just screams 1990! And google groups is pretty clunky too. If it were *me* writing the interface, I’d also add provision to be able to rate responders as well as individual posts or threads. When I read high-volume mailing lists, I already gravitate towards reading threads where I know the person’s reputation, and know there’s going to be a decent signal-to-noise ratio. Yes the standard deviation will give you some sense of..volatility..but so will separating up/down votes as two different numbers as in the case of . I’m just not sure standard deviation measurements are something normal human beings are going to grab on to as a valuable metric. Maybe there’s a visual cue that can recasting stderr as a measure of consensus/controversy…like a heat index. star color? Blue stars…everyone cool with it. Red stars..its a hotly contested issue. Personal reputation… what if we could go further and build a web of reputation such that once you’ve selected the individual authors you find have high SNR…the system then recommends post from other people your chosen authors think have high SNR. But to do that we’d have to have a centralized location to which we can all choose to publish how we score individuals. You think Jack usually writes something worth reading…in the agenda and questions categories..so you scored him highly as a notable author in your interface by +1’ing the posts from Jack you like. The system would then look at Bill’s notable author selections and sees Jack has scored Jill equally highly in the same categories and then recommends posts from Jill to you as well. In this way you build up a list of recommended authors with high SNR..and grow a discussion group. The system could always be recommending at least one more person than you’ve actively selected that scores high in your reputation web…so that there’s always an opportunity to grow your personal discussion group..but in a smart way. You could reverse it and use this sort of feedback to figure out how to be a better author by getting some data from everyone about what categories you tend to make a positive impact in and what categories you are part of the noise…so you can try to be better…so we can all try to be better. I’m my LUG we’ve been interested in replacing our mailing list with a forum for a long time and it remains a pending project. 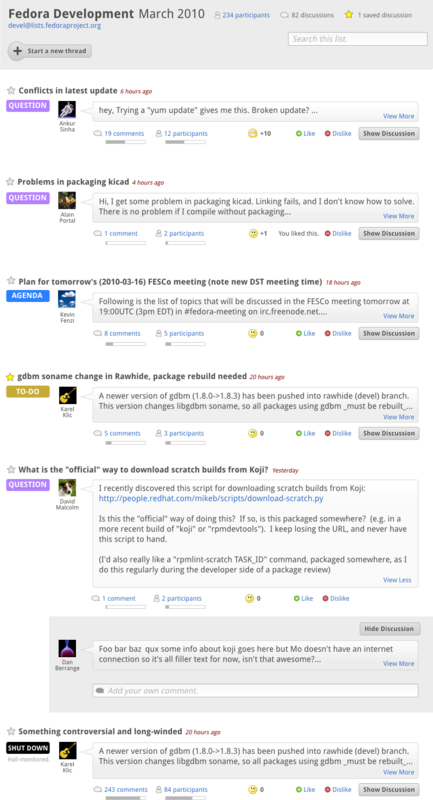 I learnt about JQuery’s forum powered by SoHo Discussion and then started hacking on a Django-based forum program (DjangoBB) in order to add the most of the features from SoHo Discussions we’re interested at but it’s still a work in progress. I really like this idea since it would somewhat bring the “best of both worlds”, theoretically, but I a bit of a non-believer in it for now until a clear implementation path is drafted. So that’s my suggestion: instead if interating for a sleeker UI please consider drafting the implementation strategy in a wiki so the UI can be analyzed under the light shed by the implementation path. When you said this is aimed to augment the experience of the mailing list I can imagine how the web interface can be built taking the mails as input but can’t yet imagine how all of the new richness of this interface would flow back to the plain text mailing list without being too complicated or too spammy. Anyway, kudos for the intent, this is an area that definitely needs more work and even widely used traditional forum software is starting to look way to old with sites like StackOverflow, SoHo discussions and GetSatisfaction. Many web discussion interfaces fall flat in their understanding of threading. Mail clients too, for that matter. A thread isn’t the whole tree of messages starting from one initial message — a thread is a contiguous conversation _within_ that tree. Especially as a particular discussion grows large, it’s important to be able to untangle that. I don’t necessarily care if someone replies to a distant branch of the tree, but care more about replies “near” where I was looking. I might even like to entirely lop off a branch without killing the whole conversation. Todd Lehman’s LUGnet forum, which is nntp-backed instead of mailing lists, has a pretty nice interface for the turn-of-the-century timeframe when it was developed — see http://news.lugnet.com/build/?n=*,-20&v=c , or take a look at down near the bottom of http://news.lugnet.com/dear-lego/?n=5603 (selected at random) for an example of how longer threads are displayed. I would like something like this a lot. Especially if a sensible group of people sat down and gave discussion mechanics in the community some serious thought, i.e. how posters would be rated etc. Also, they could contemplate if certain processes or workflows currently being carried out on mailing lists could be ‘moved out’ and done more effectively in dedicated tools (like the one for wallpaper design you made mock-ups of) and how these tools could interact with each other. I think it is both an awesome ideas for some people, and also not good idea for some people who use email properly. I think the web interface would be used by people like Mairin and other who likes it (including me!). Those people would need the richness features of the software. While other people who likes using just proper email, they can just extract the mails from the mailing list server. So, I do not think this web interface ideas would conflict with the one which use proper mail only. It is just accomodating some people who needs to digest all the information differently. As Matthew Miller mentioned, some mechanism to split off a subtree and promote it as a new thread. Maybe by some sort of vote or by a moderator. Maybe merges as well. Automatically subscribe/favorite a thread if you post to it. Daily summaries by email, with links to active threads that you’re following. Mairin, Beautiful porposal for the mailing lists interface. I attend to your talk in the LibrePlanet, very nice. Awesome! It’s a shame that people have to rely on Google Groups just to get decent archival/search functionality. Mailman 3 is going to decouple the list mgr back-end from the terrible UI. Any thoughts on how to align and take this forward? Have you looked at GroupServer? It is a GPL mailing list manager with a web forum interface. It has some of the features you have mentioned such as flattened threads, and thread summaries. We have tried to maintain equivalence between the web and email interfaces, which makes features like ratings and tagging a challenge. Do you know if there’s any update on that? Has anyone worked on it?